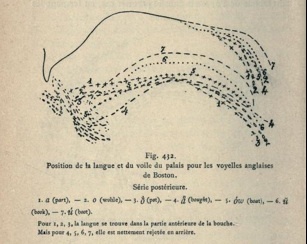 'Position of the tongue and soft palate in the English vowels of Boston', from Principes de Phonétique Expérimentale, L'abbe JP Rousselot, 1897. Below are lists of current or ongoing research projects in the Linguistics Phonetics Lab by our research groups and people we collaborate with. Bowern, C., J. McDonough, K. Kelliher, 2012. "The phonetics of Bardi (Nyulnyulan)" Journal of the International Phonetic Association, volume 42, issue 03, pp. 333-351. Iskarous, K, J. McDonough, D. H. Whalen. 2012 "A gestural account of velar contrast: the back fricatives in Navajo'' Laboratory Phonology 3.1: 195-210 . J. McDonough, B. Tucker. 2012 "Replicating P. E. Goddard: A contemporary airflow and EGG study of Dene Suline.'' University of Rochester Working Papers in the Language Sciences (WPLS: UR) Volume 4:1. P 45-56. J. McDonough and V. Wood. 2008. "The stop contrasts of the Athabaskan languages" Journal of Phonetics. V36.3, 427-449. J. McDonough, D. Whalen. 2008. "The phonetics of native North American languages" Journal of Phonetics. V36.3, 427-449. McDonough, J. 2003. The Navajo Sound System. Kluwer Academic Press. "What phonetics tells us about constituency" 18th Workshop on Structure and Constituency in the Languages of the Americas (WSCLA 18), UC Berkeley, April 2013. Invited. "The areal properties of tone in the Mackenzie Basin Dene (Athabaskan) languages". Conference on Language Documentation and Conservation, University of Hawai'i February 2013. "An investigation of the three tone system in Tsuut'ina (Dene)." J. McDonough, J. O'Loughlin C, Cox.. "Acoustic Society of America (ASA) Montreal. (June, 2012). Prosody in the Wider World (ProWW)}, Universitat zu Koln, May 2012. Joyce McDonough, "Language documentation: Experimental and instrumental data collection in the field" Invited Symposium: Documentary Linguistics, LSA, 2010, Baltimore. An online speech atlas of the Dene speech communities in the Mackenzie River Basin area (Northwest Territories, Alberta, Saskatchewan, Manitoba), funded by the NSF. The Dene Speech Atlas covers the five Dene language groups spoken in this area: Dene Sųłiné (Chipewyan), North Slavey, South Slavey, Tłį Chǫ (Dogrib) and Tsuu T’ina (Sarcee). The Dene Speech Atlas documents and describes the phonetic structure of the sound phonemes of these languages. Heike Lehnert-LeHouiller, Neil Bardhan and J McDonough, 2010, "The importance of the acoustic realization of pronunciation variation in lexical activation", LSA, 2010 Baltimore. Lab members Heike Lehnert-LeHouiller and Joyce McDonough in collaboration with colleagues in BMEBioMedical Engineering, are setting up an ultrasound project for collecting and analyzing data on tongue movement during speech. BME collaborators include: Steven McAleavey, Mathews Jacob, Diane Dialecki. H. Lehnert-LeHouillier, J. McDonough and S. McAleavey, 2010. "Prosodic Strengthening in American English Domain-initial Vowels", Speech Prosody Chicago. Jacob, M., H. Lehnert-LeHouillier, S. Bora, S. McAleavey, D. Dialecki, J. McDonough. 2008. "Speckle Tracking for the Recovery of Displacement and Velocity Information from Sequences of Ultrasound Images of the Tongue", Proceedings of the 8th International Seminar on Speech Production, Strasbourg France, 53-57, Strasbourg, France. A research project investigating the perception and production of nasality in vowels. Collaborators include Heike Lehnert-LeHouiller, Joyce McDonough, Neil Bardhan, Michael Berger, Meghan Clayards. J. McDonough, H. Lenhert-LeHouiller, N. Bardhan, 2009. "The perception of Nasalized Vowels in American English: An investigation of online use of vowel nasalization in lexical access.'' in University of Rochester Working Papers in the Language Sciences (WPLS: UR) Volume 5:1. Joyce McDonough, Heike Lenhert-LeHouiller & Neil Bardhan, 2009, "The Perception of Cues to Nasality vs Place of Articulation in Vowels", Nasal 2009, Montpellier, France. This project investigates the representation of vowels in the responses of auditory models at the level of the midbrain (inferior colliculus). Carney, L., J. McDonough. 2012. "Predicting discrimination of formant frequencies in vowels with a computational model of the auditory midbrain.'' IEEE-CISS, Princeton. L. Carney, T, Li. S, Li, J. McDonough. (June, 2013) "Using a computational model for the auditory midbrain to explore the neural representation of vowels". Acoustic Society of America (ASA) Montreal. Collaboration between Joyce McDonough and jazz pianist Harold Danko, Eastman School of Music (ESM), investigating the relationship between rhythm in speech and music. This collaboration is part of the larger Sound and Music Initiative under development at the University, involving College faculty in Engineering, BCS, Linguistics, Music and faculty from the Eastman School of Music, with the intent of developing curriculum and facilitating research among faculty and students in Music Cognition, Music Engineering, Language and Music. Keturah Bixby, E. Marvin, J. McDonough. "Musical Effects of Perceptual Grouping". 11th Annual Auditory Perception, Cognition and Action Meeting (APCAM 2012)} Minneapolis. McDonough, J., H. Danko, J. Zentz. 2007. ``Rhythmic structure of music and language: an empirical investigation of American jazz masters Louis Armstrong and Jelly Roll Morton''. University of Rochester Working Papers in the Language Sciences (WPLS: UR) Volume 3:1. P 45-56. Main software on three Macs. Linguistics Department: 2 portable macBooks, portable projector. ultrasound: housed in Steven McAleavey's lab in BME. Rochester Center for Brain Imaging (RCBI). Other special resources, such as MRI machines, are available for research use in the RCBI through the membership of Linguistics in CLS. The RCBI includes a research-dedicated state-of-the-art 3T magnet equipped for conducting fMRI during a wide range of cognitive and perceptual tasks.